Poleetical economy is a term uised for studyin production an trade, an thair relations wi law, custom, an govrenment, as well as wi the distribution o naitional income an wealth. 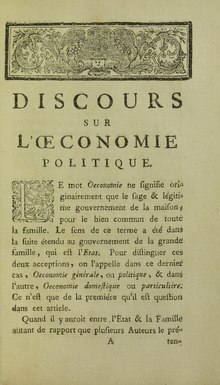 Poleetical economy oreeginatit in moral filosofie. It wis developed in the 18t century as the study o the economies o states, or polities, hence the term poleetical economy. This page wis last eeditit on 8 August 2016, at 16:58.